AcidSafe Liquid is a heavy-duty de-greaser that neutralizes acid residue and boil-over while cleaning battery terminals and cases. The purple liquid changes to an orange or yellow color when it comes in contact with acids. Once the acid is neutralized, the liquid turns back to purple, indicating a safe, neutral pH range. AcidSafe Liquid cuts through harmful contaminants and residue on the surface of forklift batteries. Periodic cleaning extends battery life and performance as well as reducing electrical problems in forklifts. This environmentally friendly formula complies with OSHA and UFC and keeps batteries running longer. 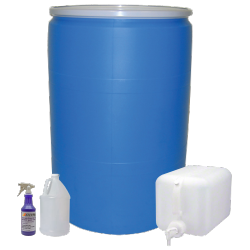 BHS AcidSafe Liquid comes in 1-quart, 1-gallon, 5-gallon, and 55-gallon quantities. Contact our sales team at 1.800.BHS.9500 to learn more about AcidSafe Liquid and other battery room cleaning products.